With record heat and a wildfire season that in western Montana is 75-80 days longer (some say up to 105 days for the west! ), it can be difficult to keep track of every fire event. Whether you're staying in town or headed on an outdoor adventure, check out these resources to know where wildfires are burning, where the smoke is trending, and to find trails to hike on during fire season. We even have info on "fire wising" your property. And if you live in a fire prone area, sign up for fire alerts from smart911. The hour by hour Air Quality report for Montana towns is HERE. And the latest report from Missoula City-County Health Dept is HERE. These reports are essential to understanding where we are and where we're headed! We love THIS MAP (right) hosted by Climate Central with both fire boundaries and smoke plumes (note: it might take a while to load). Check out their map and and read more about climate change indicators. More Live Maps. Note that all these Button Links take you to pages outside of Summer Smart and Climate Smart. Wildfires Near Me. You can even sign up for automatic alerts! Another great map: 48 hour air quality forecasts from Washington State University. Up-to-date information about active fires. Includes location, size, status, and links to detailed maps. Fire map with ability to zoom in to see specific fire area. There is a second, super cool USFS mapping service that shows "daily runs" and even smoke. See BlueSky Daily Runs. Daily updates about fires by state. Includes location, size, agency, percent contained, links to maps, and contact number for additional info. This large incident map is updated on Fridays or as fire conditions warrant. Fire locations are based on data provided by the National Interagency Coordination Center and are subject to change. Looking for a new hiking spot? Check out Hike Wild Montana for trails around the state, up-to-date trail conditions, and reviews from other hikers. Combined with the information on active fires, Hike Wild Montana is a great way to find a a smoke-free place to recreate! Do you need to "Fire Wise" your home or property? Check out this interesting article: Learning to Live with Wildfire: how communities can become 'fire-adapted'. If your home is in or near the WUI - the Wildland Urban Interface - it is smart to be "FireWise" - head here for everything you need to know. And we really like all the advice and information at Wildfires.org. 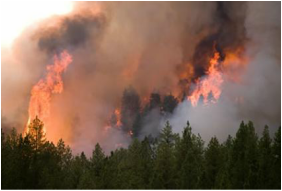 From their site: This page explains what actions to take if you receive a fire weather watch alert from the National Weather Service for your local area and what to do before, during, and after a wildfire. ﻿Check out resources on climate change and wildfire from these organizations! Links go to climate-fire specific pages. See Forests and Fires and Western Montana to help put these fires in context. Is it climate, or management, or natural?